Robert E. Godosky has 20 years of experience as an attorney, and has spent his entire career representing individuals injured by the negligence of others. Robert has tried cases in all areas of personal injury, including medical malpractice, labor law, automobile accidents and premise liability accidents. Recently, he obtained a multi-million dollar verdict for the family of a disabled firefighter who died as a result of hospital negligence. 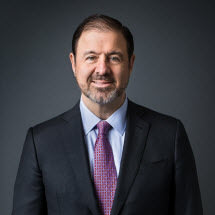 He handles the majority of the medical malpractice cases in the firm and assumed the duties of Managing Attorney for Godosky & Gentile in 1999. Robert Godosky was appointed to the Board of Directors of the New York State Trial Lawyers Association in 2004. He has received the "AV" rating * under Martindale-Hubbell's peer review rating system. Robert is a graduate of the Fordham University School of Law.